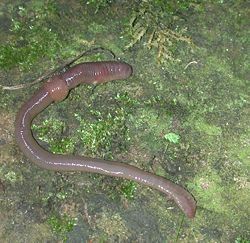 Earthworm is the common name for the larger terrestrial invertebrates of the Oligochaeta (which is either a class or subclass depending on the author) in the phylum Annelida (segmented worms). In particular, the term earthworm commonly is applied to those worms belonging to the family Lumbricidae and the genus Lumbricus. Other common names for earthworm include "dew-worm," "night crawler," and "angleworm." Earthworms are also called megadriles (or big worms), as opposed to the microdriles, which include the families Tubificidae, Lumbriculidae, and Enchytraeidae, among others. The megadriles are characterized by having a a vascular system with true capillaries, male pores behind the female pores, and a multilayered clitellum (a thickened glandular section of the body wall, which is much more obvious than the single-layered one of the microdriles). In addition to important ecological and economic benefits, earthworms provide biological, chemical, and physical benefits to soil fertility. This later "purpose for the whole" is in harmony with the earthworm's "purpose for the individual": As the earthworm advances its own maintenance, development, and multiplication, it aerates and mixes the soil, helps with composting (converting dead organic matter into rich humus), and converts soil particles into accessible nutrients. There are over 5,500 named species of earthworms worldwide, existing everywhere but in polar and arid climates. They range in size from two centimeters (less than one inch) to over three meters (some about 11 feet) in the Giant Gippsland Earthworm (Megascolides australis) of Australia. 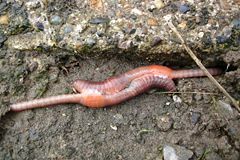 One of the common earthworm species found in temperate regions is the reddish colored, deep-burrowing Lumbricus terrestris, which grows to about 25 centimeters (10 inches). In temperate zone areas, the most commonly seen earthworms are lumbricids (Lumbricidae), mostly due to the recent rapid spread of a relatively small number of European species. However, there are many other families, including Megascolecidae, Octochaetidae, Sparganophilidae, and Glossoscolecidae. These other families are often differ from the lumbricids in behavior, physiology, and habitat. 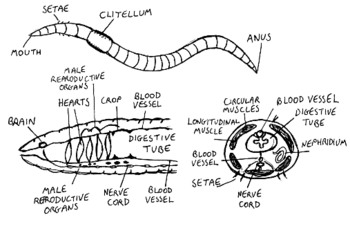 As annelids, earthworms are triploblastic protostomes with a coelom (at least historically), closed circulatory system, and true segmentation. Protosomes are animals with bilaterial symmetry where the first opening in development, the blastophore, becomes its mouth. Triploblastic means that they have three primary tissue areas formed during embryogenesis. A coelom is a fluid-filled body cavity. The earthworms' closed circulatory system includes two main blood vessels that extend through the length of their body: a ventral blood vessel which leads the blood to the posterior end, and a dorsal blood vessel which leads to the anterior end. The dorsal vessel is contractile and pumps blood forward, where it is pumped into the ventral vessel by a series of "hearts" which vary in number in the different taxa. A typical lumbricid will have five pairs of hearts; a total of ten. The blood is distributed from the ventral vessel into capillaries on the body wall and other organs and into a vascular sinus in the gut wall where gases and nutrients are exchanged. This arrangement may be complicated in the various groups by suboesophageal, supraoesophageal, parietal and neural vessels, but the basic arrangement holds in all earthworms. Eisenia fetida – with head regeneration, in an anterior direction, possible at each intersegmental level back to and including 23/24, while tails were regenerated at any levels behind 20/21. Lumbricus terrestris – replacing anterior segments from as far back as 13/14 and 16/17 but tail regeneration was never found. Perionyx excavatus – readily regenerated lost parts of the body, in an anterior direction from as far back as 17/18, and in a posterior direction as far forward as 20/21. Lampito mauritii – with regeneration in anterior direction at all levels back to 25/26 and tail regeneration from 30/31; head regeneration was sometimes believed to be caused by internal amputation resulting from Sarophaga sp. larval infestation. Earthworms are hermaphrodites (both female and male organs within the same individual), but generally cannot fertilize their own eggs. They have testes, seminal vesicles, and male pores that produce, store and release the sperm, as well as ovaries and ovipores. However, they also have one or more pairs of spermathecae (depending on the species), which are internal sacs that receive and store sperm received from another worm during copulation. Copulation and reproduction are separate processes in earthworms. The mating pair overlap front ends ventrally and each exchanges sperm with the other. The cocoon, or egg case, is secreted by the clitellum, the external glandular band that is near the front of the worm, but behind the spermathecae. Some indefinite time after copulation, long after the worms have separated, the clitellum secretes the cocoon, which forms a ring around the worm. The worm then backs out of the ring, and as it does so, injects its own eggs and the other worm's sperm into it. As the worm slips out, the ends of the cocoon seal to form a vaguely lemon-shaped incubator (cocoon) in which the embryonic worms develop. The young worms emerge as small, but fully formed earthworms, except for lacking the sexual structures, which develop later. Some earthworm species are mostly parthenogenetic (development of an embryo without fertilization by a male), in which case the male structures and spermathecae may become abnormal or missing. Earthworms travel underground by the means of waves of muscular contractions, which alternately shorten and lengthen the body. The shortened part is anchored to the surrounding soil by tiny claw-like bristles (setae) set along its segmented length. (Typically, earthworms have four pairs of setae for each segment, but some genera are perichaetine, having a large number of setae on each segment.) The whole process is aided by the secretion of a slimy lubricating mucus. In more compacted soils, the earthworm actually eats its way through the soil, cutting a passage with its muscular pharynx and dragging the rest of the body along. The ingested soil is ground up, digested, and the waste deposited behind the worm. One often sees earthworms come to the surface in large numbers after a rainstorm. There are three theories for this behavior. The first is that the waterlogged soil has insufficient oxygen for the worms; therefore, earthworms come to the surface to get the oxygen they need and breathe more easily. However, earthworms can survive underwater for several weeks if there is oxygen in it, so this theory is rejected by some. Secondly, some species (notably Lumbricus terrestris) come to the surface to mate. This behavior is, however, limited to a few species. Thirdly, the worms may be using the moist conditions on the surface to travel more quickly than they can underground, thus colonizing new areas more quickly. Since the relative humidity is higher during and after rain, they do not become dehydrated. This is a dangerous activity in the daytime, since earthworms die quickly when exposed to direct sunlight, with its strong UV content, and are more vulnerable to predators such as birds. While, as the name earthworm suggests, the main habitat of earthworms is in soil, there is a diversity of habitats among the species. The brandling worm Eisenia fetida lives in decaying plant matter and manure. Arctiostrotus vancouverensis, from Vancouver Island and the Olympic Peninsula in Western Canada, is generally found in decaying conifer logs or in extremely acid humus. Aporrectodea limicola and Sparganophilus, as well as several other types of earthworms are found in mud in streams. Even among the species living in soil, there are special habitats, such as soils derived from serpentine minerals, which have an earthworm fauna of their own. Earthworm populations depend on both physical and chemical properties of the soil, such as soil temperature, moisture, pH, salts, aeration and texture, as well as available food and the ability of the species to reproduce and disperse. One of the most important environmental factors is pH, but earthworms vary in their preferences. Most earthworms favor neutral to slightly acid soil. However, Lumbricus terrestris are still present in pH of 5.4 and Dendrobaena octaedra at pH of 4.3; some Megascolecidae are present in extremely acid humic soils. Soil pH may also influence the numbers of worms that go into diapause (a temporary halt in development at an early life history stage). In some cases, the more acid the soil beyond the preferred, the sooner worms to into and remain in diapause. Earthworms form the base of many food chains. They are preyed upon by many species of birds, including starlings, thrushes, gulls, crows, and robins. Mammals such as hedgehogs and moles eat many earthworms as well. Earthworms are also eaten by many invertebrates, such as Ground beetles and other beetles, snails, slugs and flatworms. Earthworms have many internal parasites including Protozoa, Platyhelminthes, and nematodes. They are found in many part of earthworms' bodies, including the blood, seminal vesicles, coelom, intestine, or in the cocoons. In addition to ecological benefits, mentioned above, earthworms provide benefits for soil fertility and economic benefits. Biological. The earthworm is essential to composting; the process of converting dead organic matter into rich humus, a medium vital to the growth of healthy plants, and thus ensuring the continuance of the cycle of fertility. This is achieved by the worm's actions of pulling down below any organic matter deposited on the soil surface, either for food or when it needs to plug its burrow. Earthworms often come to the surface and graze on the higher concentrations of organic matter present there, such as leaves or manure. Once in the burrow, the worm will shred the leaf and partially digest it, then mingle it with the earth by saturating it with intestinal secretions. Chemical. As well as dead organic matter, the earthworm also ingests any other soil particles that are small enough (including stones up to 1/20 of an inch across) into its "crop." In the crop, minute fragments of grit grind everything into a fine paste, which is then digested in the stomach. When the worm excretes this in the form of worm casts, which are deposited on the surface or deeper in the soil, a perfectly balanced selection of minerals and plant nutrients is made available in an accessible form. Investigations in the US show that fresh earthworm casts are five times richer in available nitrogen, seven times richer in available phosphates, and 11 times richer in available potash than the surrounding upper 6 inches (150 mm) of soil. In conditions where there is plenty of available humus, the weight of casts produced may be greater than 4.5 kg (10 lb) per worm per year, in itself an indicator of why it pays the gardener or farmer to keep worm populations high. Physical. The process of the earthworm moving through compacted soil—sometimes ingesting the soil, grinding it up, and depositing the waste—aerates and mixes the soil, and is constructive to nutrient uptake by vegetation. By its burrowing actions, the earthworm is of great value in keeping the soil structure open, creating a multitude of channels which allow the processes of both aeration and drainage to occur. Permaculture co-founder Bill Mollison points out that by sliding in their tunnels, earthworms "act as an innumerable army of pistons pumping air in and out of the soils on a 24 hour cycle (more rapidly at night)" (Mollison 1988). Thus, the earthworm not only creates passages for air and water to traverse, but is itself a vital component in the living biosystem that is healthy soil. It is important that one does not take the humble earthworm for granted. Dr. W. E. Shewell Cooper observed "tremendous numerical differences between adjacent gardens," and worm populations are affected by a host of environmental factors, many of which can be influenced by good management practices on the part of the gardener or farmer. "It may be doubted whether there are any other animals which have played so important a part in the history of the world, as have these lowly creatures"
Darwin estimated that arable land contains up to 53,000 worms per acre (13/m²), but more recent research from Rothamsted Experimental Station has produced figures suggesting that even poor soil may support 250,000/acre (62/m²), while rich fertile farmland may have up to 1,750,000/acre (432/m²). Professor I. L. Heiberg of the State University of New York has stated that in optimum conditions, the worm population may even reach 250,000,000 per acre (62,000/m²), meaning that the weight of earthworms beneath the farmer's soil could be greater than that of his livestock upon its surface. Various species of worms are used in vermiculture, the practice of feeding organic waste to earthworms to decompose (digest) it, a form of composting by the use of worms. These are usually Eisenia fetida or the Brandling worm, also known as the Tiger worm or Red Wriggler, and are distinct from soil-dwelling earthworms. Earthworms are sold all over the world. The earthworm market is sizable. According to Collicut (2006), "In 1980, 370 million worms were exported from Canada, with a Canadian export value of $13 million and an American retail value of $54 million." Lumbricid earthworms are invasive to North America. Not only have they displaced native earthworms in much of the continent, but they have invaded areas where earthworms did not formerly exist. There are no native earthworms in much of North America, especially in the north, and the forests there developed relying on a large amount of undecayed leaf matter. The worms decompose that leaf layer, making the habitat unsurvivable for certain species of trees, ferns, and wildflowers. Currently there is no economically feasible method for controlling earthworms in forests, besides preventing introductions. Earthworms normally spread slowly, but can be widely introduced by human activities, such as construction earthmoving, or by fishermen releasing bait, or by plantings from other areas. Soils which have been invaded by earthworms can be recognized by an absence of palatable leaf litter. For example, in a sugar maple - white ash - beech - northern red oak association, only the beech and oak leaves will be seen on the forest floor (except during autumn leaf-fall), as earthworms quickly devour maple and ash leaves. Basswood, dogwood, elm, poplar, and tuliptree also produce palatable foliage. The application of chemical fertilizers, sprays, and dusts can have a disastrous effect on earthworm populations. Nitrogenous fertilizers tend to create acid conditions, which may be fatal to some species. Often dead specimens of earthworms are found on the surface following the application of substances like DDT, lime sulphur, and lead arsenate. In Australia, the use of superphosphate on pastures almost totally wiped out the giant Gippsland earthworm. In addition, as earthworms are processors of large amounts of plant and mineral materials, even if not killed themselves, they can accumulate pollutants such as DDT, lead, cadmium, and dioxins at levels up to 20 times higher than in the soil. In turn, this is passed on, sometimes at lethal dosages, to the wildlife that feed upon earthworms, including such animals as foxes, moles, and birds. The most reliable way to maintain or increase the levels of worm population in the soil is to avoid the application of artificial chemicals, as well as adding organic matter, preferably as a surface mulch, on a regular basis. This will not only provide them with their food and nutrient requirements, but also creates the optimum conditions of heat (cooler in summer and warmer in winter) and moisture to stimulate their activity. A recent threat to earthworm populations in the United Kingdom (UK) is the New Zealand Flatworm (Artiposthia triangulata), which feeds upon the earthworm, but has no natural predator in the UK. In classical systems, earthworms were placed in the order Opisthopora, on the basis of the male pores opening to the outside of the body posterior to the female pores, even though the male segments are anterior to the female. Cladistic studies have supported placing them instead in the suborder Lumbricina of the order Haplotaxida. Collicut, D. 2006. Biology of the night crawler. Nature North Zine. Retrieved December 31, 2006. Darwin, C. 1881. The Formation Of Vegetable Mould Through The Action Of Worms. London: John Murray. Gates, G. E. 1972. Burmese earthworms: An introduction to the systematics and biology of megadrile oligochaetes with special reference to Southeast Asia. Transactions of the American Philosophical Society 62(7): 1-326. Mollison, B. 1988. Permaculture: A Designer's Manual. Tyalgum, Australia: Tagari Publications. ISBN 0908228015. This page was last modified on 26 September 2017, at 15:21.